Mr. Manoj Tirodkar, founder of the Global Group. He is a first generation entrepreneur, widely recognized for his efforts towards creating an efficient and environment-friendly telecom industry. He has been championing the cause of shared telecom infrastructure and green telecom. Global Group is India's leading business group focused on Network Services and Shared Telecom Infrastructure. The Group at its peak were valued at US$ 3Bn and has a tower portfolio of about 28,000 telecom towers across India, having its operations across Asia Pacific, Europe and the Middle East.Global Group’s operating companies – GTL Limited and GTL Infrastructure Limited are listed on Indian Stock Exchanges (BSE & NSE). Under the leadership of Mr. Manoj Tirodkar, Global Group Enterprises have been partnering with leaders in technologies like Qualcomm, Ericsson, Alcatel-Lucent, Nokia Siemens Networks, Huawei, ZTE etc. to offer Network services across the world. As part of his vision for a cleaner and greener environment, Global Group is focusing on reducing the carbon footprint by investing in solutions that improve the energy efficiency in telecom operations. A firm believer in Corporate Social Responsibility, Mr. Manoj Tirodkar supports a number of causes through the Global Foundation. He takes keen interest in educating the under privileged children in rural India, improving their health and helping the cause of visually challenged. 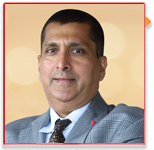 Mr. Tirodkar is recipient of several awards and recognitions for his contribution to industry and entrepreneurship. He is the first Indian to win the prestigious “World Young Business Achiever Award 2000” (WYBA) presented by Worldcom Group. He has also received the Confederation of Indian Industry’s (CII) Young Entrepreneur Trophy and Telecom Man of the year Award.